During the last two decades, the countries of Eastern Europe and the former Soviet Union have attempted to address the numerous human rights abuses that characterized the decades of communist rule. This book examines the main processes of transitional justice that permitted societies in those countries to come to terms with their recent past. It explores lustration, the banning of communist officials and secret political police officers and informers from post-communist politic, ordinary citizens’ access to the remaining archives compiled on them by the communist secret police, as well as trials and court proceedings launched against former communist officials and secret agents for their human rights trespasses. Individual chapters explore the progress of transitional justice in Germany, the Czech Republic, Slovakia, Poland, Hungary, Romania, Bulgaria, Albania, Slovenia and the successor states of the former Soviet Union. The chapters explain why different countries have employed different models to come to terms with their communist past; assess each country’s relative successes and failures; and probe the efficacy of country-specific legislation to attain the transitional justice goals for which it was developed. 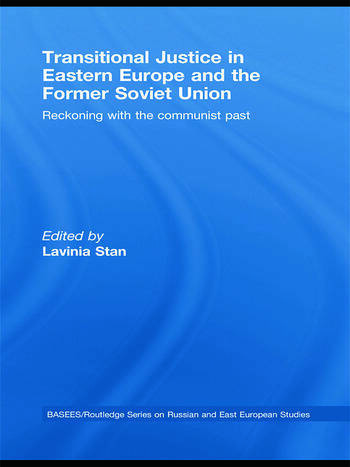 The book draws together the country cases into a comprehensive comparative analysis of the determinants of post-communist transitional justice, that will be relevant not only to scholars of post-communist transition, but also to anyone interested in transitional justice in other contexts. Lavinia Stan teaches at Concordia University, Montreal. A political scientist working on transitional justice, religion and politics, and post-communist democratization, she is the author of Leaders and Laggards (2003), co-author of Religion and Politics in Post-Communist Romania (2007), and editor of Romania in Transition (1997).